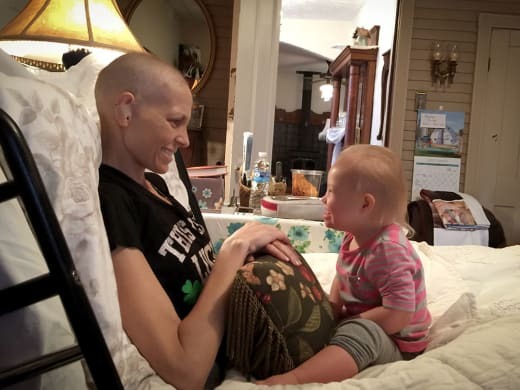 I remember hearing about Joey and Rory’s journey two years ago. I wasn’t familiar with these Nashville songwriters, but I was familiar with the many hit songs they wrote. They were a high-profile couple in Nashville and also the picture of true love and incredible talent. But the real story was of a journey…a fight. Joey was a new mother with a six-week-old baby, Indiana, who was also diagnosed with cervical cancer. The story was powerful and so, so sad. The Feek’s were so brave in documenting their journey on social media and it was a heartbreaking story to witness, but Joey’s dignity and grace in the face of a terminal illness was breathtaking. As the world cried along with the family, the end of this love story was crushingly sad…and I only knew her through pictures. This one broke my heart the most, I think. But I’m not sharing this to depress you. Far from it! Like all exemplary people, the Feeks never waivered from their love, hope, and belief in God…even when the news wasn’t good. I was lucky enough to be asked by the super-awesome Becky from Harper-Collins to review Rory Feek’s newest book, Once Upon A Farm. Perseverance, love, willingness to change even when you don’t want to, a quest for simplicity and the bond of family. And a farm. Not just any farm; a dilapidated one that was bought by an “un-handyman” (Rory) who only saw the end result of what the tattered and worn building could become. This farm is so firmly woven into the fabric of Rory, Joey, their family and their community’s life it’s just plain magical. Their quest for a simple way of life 10 years ago continues even though Rory and Indiana are now going it alone. That’s yet another thing I love so much about this story. Beautiful simplicity as a way of living. Now raising their four-year-old daughter, Indiana, alone, after his wife Joey’s passing, Rory Feek digs deeper into the soil of his life, the unusual choices he and his wife made together and the ones he’s making now to lead his family into the future. A raw and vulnerable look deeper into Rory’s heart, Once Upon a Farm is filled with powerful stories of love, life, hope and the insights that one extraordinary, ordinary man has gleaned along the way. Two years after Joey’s passing, as Rory takes their four-year-old daughter Indiana’s hand and walks forward into an unknown future, he takes readers on his incredible journey from heartbreak to hope and, ultimately, the kind of healing that comes only through faith. On his small farm south of Nashville, Rory sometimes does what he calls lifesteading — or, everything but farming. With a spirit of love, and at times amazement, Rory shares how he has embraced new and unexpected experiences, while also sharing heartwarming moments from his life with Joey. I blazed through this book in a day. Not because I had to…because I couldn’t put it down. There’s a very, very good chance I’ll read it again and really savor this “how-we” story and all the amazing life lessons that are so authentically presented in the pages. Connect with Rory via his website or on Instagram. I had not heard of these folks either until they were pretty far along in their journey. This sounds like it will be a good read thank you for the review.